Sasha DeVore loves coffee and sleeping, and firmly believes there is no wrong time of day for breakfast tacos. When she isn’t teaching her wonderful students at an elementary school in Austin, TX, she’s spending time with her equally wonderful husband, son and dogs at their home in Manor, TX. 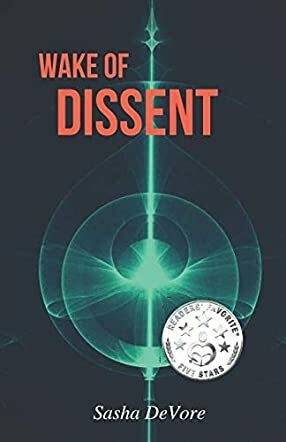 Wake of Dissent by Sasha DeVore is a young adult dystopian/science fiction story set on a futuristic Earth, after human wars have torn the Earth's atmosphere and rendered the surface uninhabitable. The human race's survival is now in the hands of the seemingly benevolent alien race called the Ancient Ones. But things are not as they seem. The Dissenters are a secret faction of humans who have discovered the truth about the Ancient Ones. When fourteen-year-old Hanu discovers a secret that could save humanity, he knows he has to take it to the Dissenters. As the Ancient Ones up the ante and Year One looms on the horizon, Hanu and his friends must find a way to convince the resistance to fight for humanity’s right to live on Earth. As dystopia goes, Wake of Dissent puts a unique spin on this popular YA genre. With a blend of entertaining three-dimensional primary and secondary characters, it is most definitely a winner. The descriptions of Earth are very vivid and captured my imagination. It was refreshing to read a dystopian story where the villain wasn’t a crazy, afraid of change human but an alien race. The Ancient Ones were the perfect antagonistic force with a believable end game. Sasha DeVore put as much thought into her protagonist as she did her antagonist. The reader may not like the Ancient Ones but will at least understand why they do what they do. Fans of UFO conspiracy theories will enjoy this novel and the story’s continuation, Year One. I love DeVore's writing! Enthralling plot and great imagery!